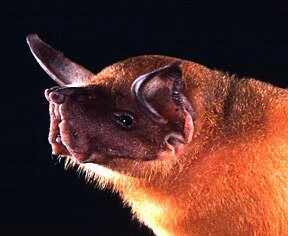 The Fishing Bat is a a small, yet highly interesting mammal, found in Central and South America. They’re often called bulldog bats for their cheek bags and small eyes that hold a close resemblance to those of a bulldog. The Fishing Bat’s natural habitat is forest regions and seaside marshes in Central and Southern America, ranging from Mexico to Argentina and they’re also found of the islands of Trinidad and Antillia. 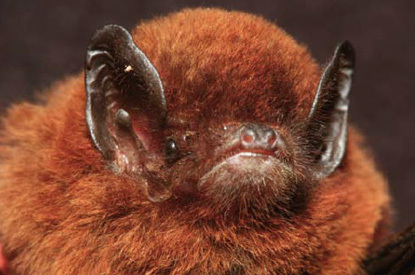 They are fairly large for bats, reaching up to 13 cm in length, while their wings stretch up to 30 cm across. The reason for the wings being so long might be that the areas Fishing Bats live in usually have few obstacles like trees and they often have to fly longer distances, thus the large wings help gliding. As its name suggests, the Fishing Bats are adapted to catching fish – their short, brown fur is water-repellent, their legs are long and equipped with massive claws to grab fish. As all bats, they’re social creatures that live in swarms. The swarms rest in trees of cliff overhangs during the day. Their resting spots can be identified from far away, because of the unpleasant odor, caused by feces and uneaten fish parts. This makes us wonder why these animals were only documented in 1953. Fishing Bats leave their resting area at dusk, looking for fish in both salty waters and freshwater areas. Navigation at night is ensured by their radiolocation system, peculiar to all bats. Obviously, these bats prey fish and it is their only feeding source. Just like eagles, they fly over waters, looking for fish. But unlike birds, the Fishing Bat doesn’t rely on it’s vision to search for prey, but, in fact they use an echolocation system, very similar to that used by many fishermen. As it turns out, animals have been using this advanced method of locating fish long before humans discovered it. Sharp claws allow the Fishing Bat to instantly catch fish near the surface, usually sizing no more than 6 cm. The fish is then stored in the cheek bags and chewed only while being on land. Repeating this strategy, the bat can catch up to 30 fishes per night. 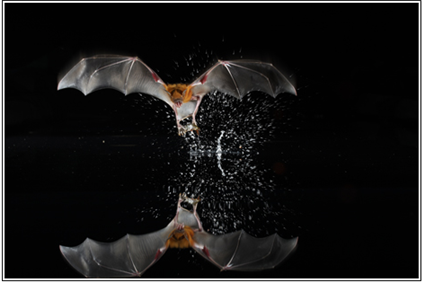 Most of the time the Fishing Bats live in mixed swarms, but females usually separate to smaller swarms nearing childbirth. Gestation period lasts for about 16 weeks, after which a blind and naked younglings are born. They learn to fly in 20 days and in a few more weeks they reach the size of an adult. Soon, they learn to find and hunt fish and become full members of the swarm. 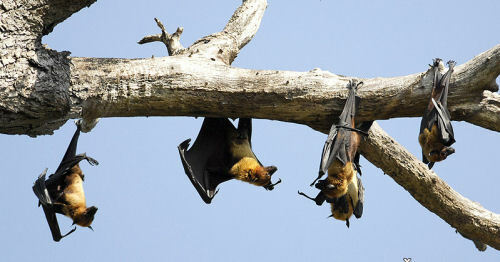 The population of the Fishing Bats is stable, although it is slowly decreasing, as a result of logging and overfishing in their inhabited areas. They are rarely confronted by humans and they mostly live isolated lives. Being relatively large, the Fishing Bats scare tourists, but in fact they’re no more dangerous than the fish they prey upon.